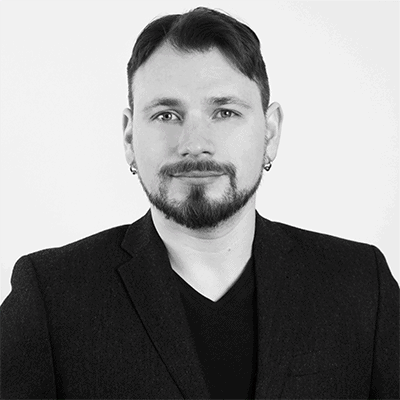 Colin has more than 10 years of experience in the design field, with an emphasis on music visualization, animation, presentation, generative art, motion graphics, and time-based media. He has worked for clients both large and small, within the spectrum of large agencies to one-to-one levels. His professional highlights include producing design and animation at Apple, Inc., Al Gore’s An Inconvenient Truth, commissions for IDN magazine, and the Cliff Bar 2-Mile Challenge campaign. His real passion lies in audio/visual collaboration, and he has produced visual design for a wide array of musicians as diverse as Snoop Dogg, Björk, Aesop Rock, Nonagon, Lusine, and Edison. Colin has spoken at many conferences in his field of study: HOW Design, HOW Interactive, NAB, VDJC, and SF Mograph. He’s also a winner of the international Cut & Paste design competition. He was a senior lecturer and instructor in the graphic design track at California College for the Arts. He has taught courses at the Academy in both Animation/Visual effects, and Web Design + New Media, across graduate and undergraduate levels. Colin holds a BFA from the Academy, and has completed MFA studies from the San Francisco Art Institute. He invites you to view his work at movecraft.com.